In 1988 I joined the database software company Oracle Systems. I worked in the Canberra sales team, where my job was to demonstrate the technical capabilities of the software to clients. One day the national sales manager arrived unannounced from Sydney and told us that he wasn’t happy with our progress. He gathered us in front of a window on the 12th floor of our inner-city office, pointed at a nearby building, and asked if anyone had canvassed it. No-one had, so he picked a sales rep at random and said, ‘Go to every floor of that building and tell them about our software’. He then pointed to another building, and another, each time dispatching a sales rep if we hadn’t worked those offices. We did as the manager instructed, and in the process we made some of the biggest sales in the history of our branch. Sales have changed a lot. Back then you were selling a product. You described its features and showed how it was superior to your competitors’ wares. But as Dan Pink argues convincingly in To Sell Is Human, now we are all salespeople because of the massive shift towards small entrepreneurial companies. In 1999, when I was working for IBM, the focus had already switched to selling solutions to business problems. These solutions were integrated and complex. The customer was less interested in a product’s features and more interested in how it was going to impact their business. Selling solutions is now an established major trend in sales. But it has come at a cost. Many salespeople are just not doing well selling solutions. The research firm CEB has shown that the gap between average-performing salespeople and star performers is close to 200% for solution sales, while it’s only 59% for transaction sales. There is a valuable opportunity here for companies to help their average performers improve their skills and close this gap. The data showed that most of the star performers – salespeople in the top 20% of reps as measured by performance against set goals – were Challengers (39%), with relatively few in the worst-performed category, the Relationship Builder (9%). takes control by pushing back on the client, pressing them a bit, and also remaining comfortable when talking about money. I’ve seen Challengers in action. They have wide interests. They spend time reading and learning. And they tell stories. They do this in order to provide insights, illustrate value, and even push back when the customer wants to fall back to old ways. If you can get your sales force to develop the skills of the Challenger rep, and also learn how to share relevant stories to bring what’s being offered to life, then you will close the gap between your average performers and your stars. I’ve done a lot of sales training in my career. I’ve learned SPIN selling, consultative selling and IBM’s sales method, among others. It seems to me that regardless of the specific sales process, there are four things you need to do to really help a customer get what they need. First, you need to build rapport with your customer. Selling is about trust. Your customer needs to know who you are and why you are there. What’s your background? Why do you care about the customer’s business? This was the perfect opportunity to share a short story about my family coming to Australia. She then shared a little bit about herself. Our conversation was immediately comfortable and we could get down to business. Second, you need to establish your credibility. As the Challenger sale illustrates, it’s important to demonstrate your knowledge of a customer’s business and its economic drivers. You need to bring some insights to the table. The celebrated psychologist, Gary Klein, says “an insight is an unexpected shift to a better story.” Stories are at the heart of building credibility. You can share a story about something that happened in a business similar to theirs and how it was tackled. If it’s unexpected and better than what they have now, you have just provided an insight. Gartner has published an amazing array of business stories illustrating innovative ways in which IT groups have made a difference. One story is about how Swedish Rail noticed that their trains were leaving platforms with empty seats. So their IT team developed an auction system to sell off the remaining places. Now each train leaves full and they have added millions of krona to their revenue. A little story like this is an analogy for many types of business problems and helps the customer to think differently. A while back we wrote a piece on four story-based practices to foster insight. You could use these techniques with your customer. Remember that to be credible, you need to bring useful insights to the table. Third, you need to demonstrate value. Your proposal should tell the story of why the suggested action is needed and how it will address the needs of the business. The story you tell will be most effective when you develop it with your customer, so that when they receive your materials it’s totally familiar – as much their story as yours. Finally, you need to ask for the business. This is not a time to tell stories. Great salespeople know when to stop talking. Silence is a powerful force. Anecdote has developed a program called Storytelling for Sales, which we have delivered to companies like IBM, Gartner and Microsoft. 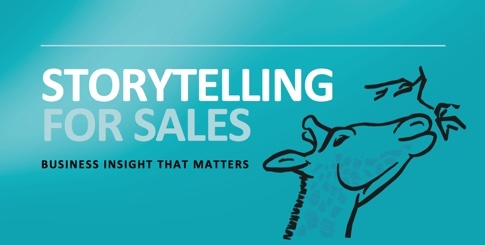 We believe that great salespeople are good storytellers and that this is a skill that can be taught. Please give us a call if you would like to know more. I really like your view on sales and the four things you need to do. The last one is the most remarkable! Ask for the business and don’t tell any extra. I always refer to 3 important stages , regarding the sales or buying process; Need – Proof – Decide. In the last phase the customer is very emotional, since 2/3 of our decisions are made in our emotions. But since he is emotional he doesn’t like to hear any extra emotional stuff. He needs a good contract! So telling stories in this part of the sales cycle is often not productive. Resonated very well with me and my experience. The connection between ‘sales’ and ‘leadership’ is consistent I believe. Everyone is a Salesperson – Everyone is a Leader – or should be! Once you work out what the next step is for your client, and what it would take for them to get there, you can build your story and illuminate the journey. Think in the abstract, find a story, an analogy or metaphor and let them see that you see ‘not just the crescent but the whole of the moon’. Hi there Damian. Great to hear from you and excellent to hear that this resonates with such an experienced and successful sales exec. All the best.